Chia seeds are a complete protein source. They provide all the essential amino acids that the human body needs in one easily digestible form. They are a good source of soluble fibre, just 1 tablespoon of chia seeds can provide approximately 5g of fibre. Chia seeds also contain vitamins A, B1, B2, B3, B5, B6, C, D, E, K and folic acid, and the seeds are also rich in minerals including boron, calcium, copper, iodine, iron, magnesium, manganese, molybdenum, phosphorous, potassium, silicon, sodium, strontium, sulphur and zinc. 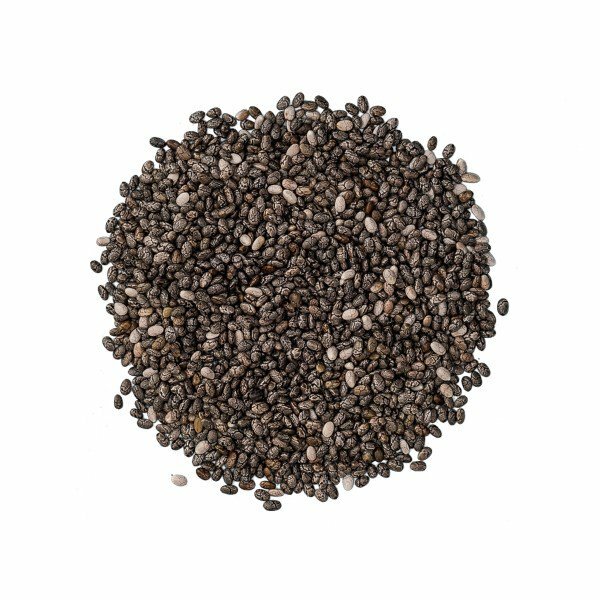 Chia seeds, like flax seeds, are 'hydrophilic' in nature. This means that they can absorb up to 12 times their weight in water, forming a thick mucilaginous gel 30 minutes after consumption. The seeds are currently undergoing research as a potential means of suppressing the appetite. Researchers have discovered that chia seeds can actually slow down the rate at which digestive enzymes turn carbohydrates into sugar, making them especially beneficial for diabetics and others with blood sugar issues. Chia seeds contain a naturally occurring source of salicylates and are best avoided by people eating a salicylate-free diet. If you have an allergy to sesame or mustard seeds then avoid consuming chia seeds. People taking blood pressure medication or blood thinners should avoid consuming chia seeds due to the fact that they contain a high level of omega-3 which acts as a blood thinner and can lower blood pressure. Chia seeds contain a rich source of omega 3 fatty acids, they can be eaten on their own as a snack or added whole to bread, cakes, biscuits and cereals, or the seeds can be ground and used as a gluten-free flour source. The seeds can also be sprouted and added to salads, soups and sandwiches. In Mexico chia seeds are used to make a popular drink called a ‘Fresca’ to make your own add 1 tablespoon of chia seed to 250ml of water, coconut water or fruit juice and sweeten to taste, let the seeds sit in the liquid for around 10 minutes, give the drink a shake and drink. The seeds can sink to the bottom of the drink so shake the container (with a lid on, of course!) inbetween drinking to evenly distribute the seeds in the drink.